Flag raising ceremony for Independence Day 2015 with BETA learners – see post. 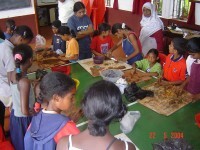 The Basic Education To Adolescents (BETA) program aims at providing functional literacy, computer courses and numeracy to primary school dropouts. Classes begun as from May 1998. Initially the program covers one class of some thirty learners of six villages of the south of the island. These learners after failing the Certificate of Primary Education (CPE) examination twice have been pushed out of the school system. The BETA Program represents a second chance for these “out of school youths” to learn to read and write and acquire some essential skills which can be useful in their life. The curriculum has been designed in such a way as to include six different learning areas. The BETA Program is still on going and the curriculum has been adapted to the needs of the learners. Halley Movement is constantly looking for assistance in order to keep the program running. We are grateful to the various international and national organisations that have supported us since 1998. A Research Study on causes of primary school failure in Mauritius was conducted prior to the Program. The recommendations of the study were instrumental to the start of the BETA Program in 1998. Learners stand to benefit most from the BETA Program. Many for the first time have access to computer education. A Lot of changes will happen and these changes are all for the better. Learners are trained to work effectively in groups. They will learn the value of team work.